Tejaswini Yojana is an empowerment Programme for adolescent girls and young women. Jharkhand government has launched this yojana to provide skill training to girls of the state. The main objective of this Yojana is to support girls between the ages 14 to 24, to complete their secondary level education and acquire relevant skills for the job. The World Bank has provided $63 million loan to India for this yojana. Tejaswini yojana is the first World Bank project in India which is fully focused on the welfare of adolescent girls and young women. It is expected to benefit nearly 6.8 lakh girls of Jharkhand. The validity period of this project is until June 30, 2021. It has been implemented in 17 selective districts of Jharkhand. Ability to access bank loan on a sustainable basis. To empower women about legal rights and knowledge about health and hygiene. Creation of strong and sustainable Self Help Group (SHP), to provide their member with economic and social support. To enable poor women to have a wider range of opportunities in the economic, social and political spheres. It also supports government policies that empower women. 1. 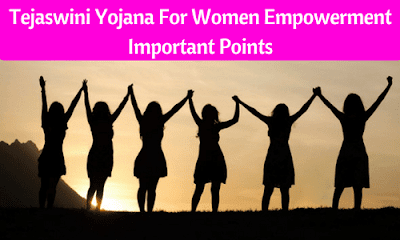 Which state in India has recently launched Tejaswini yojana for women empowerment? 2. What is the validity period of Tejaswini yojana? 3. How much loan did World Bank sanction for this project?